Children and adolescents have become more and more involved in sports practice in the last few decades, with varied levels of competitiveness. The association of skeletal immaturity and intense physical activity renders this age group especially prone to musculoskeletal lesions. Generally speaking, chronic lesions are more common in pediatric athletes than those related to acute trauma. The latter, caused by the sudden action of high-energy forces, usually do not pose a diagnostic dilemma, while chronic osteoarticular injuries related to repetitive trauma of low intensity without time for adequate repair may mimic other conditions, including articular diseases. 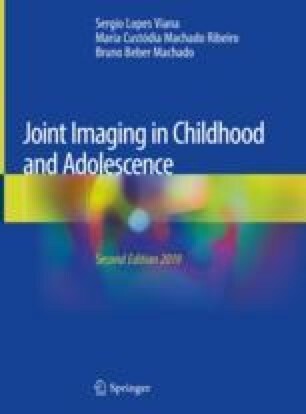 This chapter deals with imaging findings of some of the most frequent sports-related lesions in children, such as the different forms of apophysitis, osteochondritis dissecans, stress-related physeal lesions, and stress fractures.